Republicans in Congress today will vote on budget proposals that are essentially meaningless, except that they lay out how the GOP would like to structure federal policy and priorities. The White House has its own fact sheet about the House Republican budget. 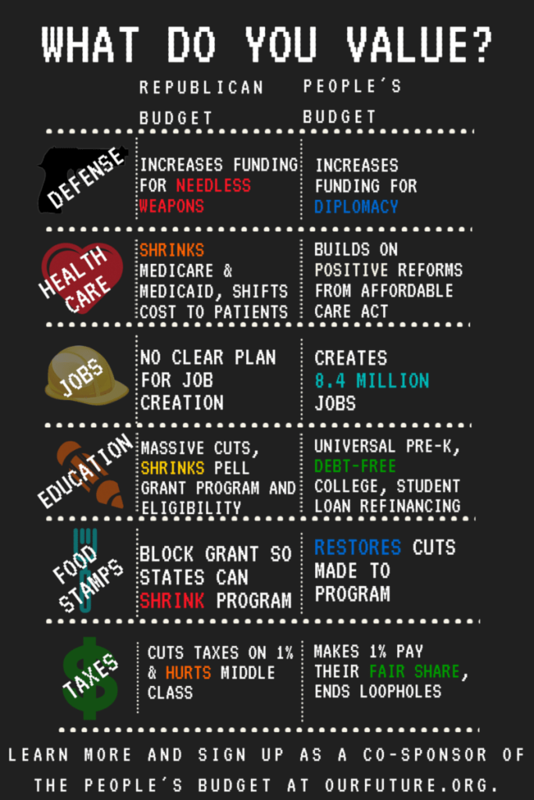 The National Priorities Project has created a detailed comparison of all the budget proposals up for consideration: President Obama’s budget, the House GOP budget, the Senate GOP budget, and the Congressional Progressive Caucus budget. And here at CAF, we put together a graphic for sharing on social networks that compares the GOP budget with the Congressional Progressive Caucus budget. The numbers are familiar by now. The House GOP budget contains $5.5 trillion in cuts. Yet, what would $5.5 trillion in cuts to “discretionary non-military spending” mean for the day-to-day lives of American families? How would the House GOP Budget affect a hypothetical average American family? Here are five areas where families will feel the effects. If the adults in the family are unemployed, the GOP budget won’t help them find work. The GOP budget contains no new funding for job creation. That’s not surprising, considering that since taking over the House in 2010, Republicans have spent their time proposing “jobs” bills that aren’t about creating jobs. The “jobs” proposals in the GOP budget are focused on undermining financial reform and stymieing new regulations with mandatory “cost-benefit analysis,” instead of actual job creation. The GOP budget will make it harder for a family to keep a roof over its head and food on the table. They may be among the 133,000 families who will lose Housing Choice Vouchers, or the 20,000 rural families who will no longer receive assistance for affordable rental housing. Republican cuts to the Supplemental Nutrition Assistance Program (SNAP), a k a food stamps, could kick as many as 11 million off the program. Republicans would block-grant the program, after making $125 billion in cuts over 10 years, and then make it easier for states to cut the program even further by toughening eligibility requirements. The Republican budget repeals the Affordable Care Act. So, if a family is among the 16 million former uninsured who have gained coverage thanks to Obamacare, the GOP budget will take that away from them. If they’re among the 130 million Americans with pre-existing conditions, they’ll go back to worrying about being denied insurance. If the adults are retirement age or older, the Republican budget will make their health care more expensive. The GOP budget does away with the longstanding Medicare guarantee, and replaces it with “premium support” (a voucher) that does not increase with rising health care costs and does not permit the government to negotiate drug prices for the program, thus shifting those costs to the elderly. If a family relies upon Medicaid, they may be among the 20 million who will lose coverage under a GOP budget that ends Medicaid as we know it. The House Republican proposal cuts funding for Medicaid and the Children’s Health Insurance Program by more than $900 billion, before block-granting both programs to states, where they will face further cuts. Those among the 8 million who rely on Pell Grants to help them afford college will find less help available. The Republican budget freezes the Pell Grant program at current levels and shrinks the program by raising eligibility requirements. Thanks to the GOP’s $1.2 billion in cuts to Title I education funding, children will lose up to 10,000 schools, 38,000 teachers, and 26,800 special education teachers, paraprofessionals, and other related staff. As many as 157,000 children will lose access to Head Start. Families who are not among the wealthiest 1 percent will see their taxes increase. Despite claiming to balance the budget within 10 years without raising taxes, the GOP budget will force millions of American families and businesses to pay about $900 billion more in taxes over the next 10 years. The Republican budget extends tax breaks for corporations and the wealthy, but lets tax breaks that benefit middle- and working-class families expire. The House GOP budget document promises “a stronger economy, where families and businesses can have more confidence and certainty in the future.” But for millions of families, it means a future filled with uncertainty and desperation.